Do you want a delicious and nutritious snack that you can have any time of day… even before bed? These muffins are made with pregnancy power foods that don’t trigger heartburn… which is great news if you need an anytime-of-day snack that’s not going to make you uncomfortable. They’re made with rolled oats, almond milk and bananas which are renowned for their alkaline properties. FYI, alkaline foods are the opposite of acidic foods that can stimulate more stomach acid and therefore heartburn. On the contrary, alkaline foods help counterbalance the pH levels of your stomach acid and are less likely to trigger heartburn. Plus, these muffins are naturally sweetened with bananas and raisins so they won’t trigger a blood sugar spike and therefore, fat storage – especially before bed. If you prefer something a little sweeter, feel free to add 3 tablespoons of maple syrup. Line a 12-cup muffin tray with paper cupcake liners. Alternatively, coat the muffin tray with butter or oil. Mix the oats, baking powder, cinnamon, raisins, and sea salt in a large mixing bowl. Mix together the mashed bananas, eggs, and almond milk in a separate mixing bowl until the mixture is smooth. Pour the banana mixture into the oats and stir well until the mixture is even. Scoop the mixture out into the muffin tray. Bake for 20 minutes or until the muffins are baked through (when you pierce a muffin with a fork, it comes out dry). Allow the muffins to cool before serving. Alternatively, store the muffins in an airtight container in the fridge for up to five days. I've been getting a lot of cravings for muffins this pregnancy. There's something about the texture and slight sweetness of a muffin that makes it a tempting breakfast or mid-afternoon snack. Instead of opting for the sugar-filled, white flour muffins you find in stores and cafes (the ones that taste delicious at the time but leave you in a sugar slump an hour or two later), I've been making these paleo choc chip muffins with just enough sweetness to satisfy that craving. And with almond flour and coconut oil, these muffins also pack a nutritional punch of added protein and healthy fats. 1. Preheat your oven to 350F. Line a 12 tin muffin tray with blue and red paper cupcake liners. 2. In a large mixing bowl, add the almond flour, baking soda and sea salt. Mix well. 3. Add the melted coconut oil, maple syrup and eggs. Mix together so the mixture is nice and smooth. 4. Add the choc chips or cacao nibs. Mix until smooth. 5. Evenly scoop out the mixture into the paper cupcake liners. 6. Place the muffin tray on the middle rack of oven. Bake for 18 minutes. 7. Allow 5-10 minutes to cool before serving. Enjoy! Bone broth has long been used in traditional diets for its nourishing and healing properties. However, bone broth has sadly been displaced from our modern diets in favor of faster and more processed foods. This is unfortunate because bone broth is the richest food source of collagen and glycine - two fundamental building blocks for healthy skin, hair and nails - and not to mention, essential for baby's bone and organ development while in utero. For the pregnant woman, bone broth can help prevent stretch marks and cellulite because collagen is the main protein structure in our connective tissues like our skin. A collagen-rich diet ensures smoother, more elastic skin. It also improves joint and bone health. A collagen-rich diet can also help heal the lining of your gut for anyone dealing with an autoimmune disease like 'leaky gut' or digestion issues. This home-made chicken bone broth is so easy to make, you can prep it in it minutes and within a few hours, you'll have enough broth to last you over a week. I like to make this in a slow cooker over the weekend, and then when it's ready, pour it out into smaller containers and freeze for a later date. Please note that the key step to nutritional bone broth, is to add 2 tablespoons of apple cider vinegar to the broth, and let it sit for 20 minutes before you start boiling it. The apple cider vinegar will help draw out the collagen from the bones and into the broth. 1. Place chicken carcass (or chicken thighs) into a slow cooker or a large stock pot. 2. Fill slow cooker or stock pot with water until 2 inches from the brim. 3. Pour apple cider into water and let it sit for 20 minutes. While you wait, roughly chop the onion, carrots, celery stalks and parsley sprigs. 4. Put onion, parsley, carrots and celery pieces into the slow cooker or pot. Sprinkle a teaspoon of sea salt into water. 5. Turn slow cooker on for 24 hours. If you're using a stock pot, bring the broth to boil and then turn heat to low so it's gently simmering for as close to 24 hours as possible. 6. When the broth is ready, let it cool and add more sea salt and pepper as desired. Serve to drink it right away or place it in containers and freeze to use another time. I've been craving a lot of Asian flavors this pregnancy... maybe it's the spicy kick or the mix of garlic and ginger that I'm craving, but I've been eating everything from miso soup to curry noodles! In those first few weeks of pregnancy, especially when I was too nauseous to cook, I ate a lot of takeout. However, when my nausea lifted and I was able to cook again, I started cooking my own Asian-inspired meals because I could ensure exactly what I was putting into it, and I could use whole grain so I would cook with either brown rice or brown rice noodles. Here's one of my favorite stir-fry dishes that's so easy to make, it'll take less that 15 minutes. And the best news is that you can choose what veggies and protein you'd like to use. In this case, I've added a 2-egg omlette but you can add grilled chicken or shrimp if you prefer. 1. Boil brown rice spaghetti according to instructions. Drain and set aside once noodles are cooked. 2. Finely chop the garlic and veggies. Whisk 2 eggs in a bowl and set aside. 3. Heat a skillet over medium heat. Once hot, add 1 tbsp of oil and garlic. Stir garlic for 1 minute, making sure it doesn’t burn. 4. Add broccoli florets, mushrooms and carrots. Stir for 3-5 minutes until veggies are cooked through. Reduce to lowest heat. 5. Heat a small frypan over medium heat. Once hot, add 1 tbsp of oil and add eggs. Let the eggs set in one thin layer across the pan. Flip the omelet once cooked through (and you can see bubbles surfacing). Cook the other side of the omelet until it is lightly browned. Once finished, slide the omelet onto a plate and cut into slices. 6. Add omelet slices to the veggie stir-fry along with the brown rice noodles. Sprinkle in salt and pepper, 1 tbsp tamari and 1 tbsp sesame oil. Mix thoroughly. 7. Transfer to plate and sprinkle black sesame seeds as desired. There weren’t too many foods I could eat during the weeks I had extreme morning sickness. Thankfully, avocado toast was still something I could stomach and on the days that I felt like a “nutritional boost”, I would make this smashed avocado and chickpea sandwich. Chickpeas (otherwise known as garbanzo beans), are one of the richest sources of folate and Vitamin B6, which are two essential vitamins for healthy fetal development, especially in the first trimester. To sum it up, this sandwich is super easy to make, requires little prep time, is nutritionally dense and most importantly, is gentle on the stomach. 1. Drain and rinse the chickpeas. 2. In a large mixing bowl, add the chickpeas and contents of the avocado. 3. With a fork or potato masher, mash the chickpeas and avocado until your desired consistency. 4. Sprinkle the lemon juice, garlic powder, sea salt, pepper and chili flakes if you want an extra “kick”. Mix until even. 5. Toast your bread. Spread the avocado and chickpea mixture for toast, or add another slice to make a sandwich. If you can stomach it, add some baby spinach. Enjoy! Did you know that 1 cup of strawberries have more Vitamin C than an orange? If you’re looking to boost your health and your baby’s development, this simple smoothie is perfect for you. Because strawberries are listed as the #1 most-sprayed crop in the US, if you can’t afford fresh strawberries, then frozen organic berries are the way to go. Frozen berries are great when added to yoghurt (let them defrost for a few minutes first) – or in a smoothie like this one. 1. Place frozen strawberries, peach slices, yoghurt, almond milk and ice cubes in a blender and blend on high for about a minute, or until smooth. 2. Add more almond milk or more ice cubes depending on your desired thickness. More ice cubes will make it thicker, almost like a sorbet (as pictured). 3. Pour into glass or bowl and enjoy! This delicious bowl is a perfect lunch or dinner during pregnancy. It has lots of vitamin-packed veggies like broccoli, sweet potato and cabbage, complex carbs from quinoa and protein from low-mercury seafood such as shrimp. For more yummy recipes like this one, check out Meray Frose’s blog. 1. In large cast-iron skillet or grill pan, heat 1 teaspoon olive oil over medium high heat. Add shrimp, onions, broccoli, and already baked diced sweet potatoes to pan, keeping each ingredient in a quarter of the pan so they don’t mix together. 2. Season shrimp with ground pepper, and drizzle with a teaspoon of Tamari. 3. Remove shrimp from pan once it turns pink and cooked through and sweet potatoes and broccoli are seared on both sides. 4. Add cooked quinoa to heated skillet and stir in coconut flakes and remaining teaspoon of Tamari. Remove from pan when quinoa is heated through. 5. In a blender or magic bullet, blend lime juice, almond butter, and water adding more water depending on desired thickness of dressing and how juicy limes are. Refrigerate to thicken. 6. 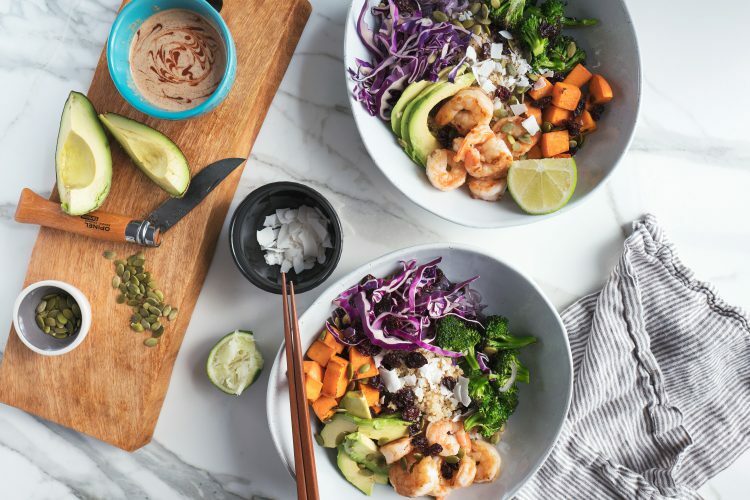 Divide coconut quinoa among two shallow serving bowls, and top with shrimp, onions, sweet potatoes, broccoli, cabbage, avocado, pumpkin seeds and a drizzle of almond butter lime dressing. These raw cacao truffles are naturally sweet and fudge-like, making them a perfect sweet treat or mid-afternoon pick me up. The best thing about them is that they’re made from Omega-3-rich walnuts and fiber-packed dates and chia seeds. Walnuts are a pregnancy superfood because they’re packed with plant-based protein and Omega-3 fatty acids, which are essential for your baby’s developing brain. The fiber in the dates and chia seeds are also a pregnant mama’s best friend. Fiber promotes digestive health and helps keep you “regular” during pregnancy. You can easily make a batch and store the rest in your fridge for up to a week. This recipe makes about 12 small truffles – but you can make more or less, depending on the size you prefer. 1. Soak 1 cup of Medjool dates in a bowl of warm water for 1 hour. This will soften the dates and make them easier to blend. 2. Place the walnuts in a food processor, and grind so you have fine walnut flour. 3. Add the dates, cacao powder, chia seeds, coconut oil, vanilla extract and sea salt to the foodprocessor. Process again so you have an even, sticky mixture. 4. Scoop 1 tablespoon of the mixture at a time into your hand and roll into a ball. 5. Roll each cacao truffle onto a plate of cacao power to “dust” it. Feel free to skip this step if you think the extra cacao powder is too bitter. 6. Place the cacao truffles into a container lined with parchment paper. Store them in the fridge for up to a week or enjoy straight away! I love making these frittata muffins at the start of the week so I have bite-sized meals and snacks ready to go. You can make these in less than 15 minutes, store them in the fridge and have breakfast or ready to go if you’re pushed for time. 2. Crack the eggs into a mixing bowl and gently whisk. 3. Heat a skillet over medium heat. Add the oil and garlic and stir vigorously for 30 seconds. 4. Add the broccoli florets to the skillet and stir for 2 minutes. 5. Pour broccoli into mixing bowl with the eggs. 6. Grease a 12-muffin tray or line the tray with baking cups. 7. Pour eggs and broccoli mixture evenly into the muffin tray. 8. Sprinkle cheddar cheese on top of each frittata. 9. Place into oven and bake for 12 minutes or until frittatas are firm. Enjoy! Almond flour is a great substitute for wheat flour in pancakes because it has more nutritional value without the ‘empty calories’ that you’ll find in white-flour pancakes. Almonds are a pregnancy superfood because they're high in fiber, calcium and Vitamin E. They're also a rich source of plant-based protein. Protein can't be converted and stored as fat in the same way that excess carbohydrates can, so almond flour is a great alternative if you want to prevent accelerated weight gain. 1. Whisk the milk, eggs, maple syrup and vanilla essence together in a large mixing bowl. 2. Gradually mix in the almond flour, baking soda and sea salt. Keep mixing until the mixture is smooth. 3. In a small fry pan, heat 1 tablespoon of oil or butter over medium-high heat. 4. Pour 1 scoop of the mixture into the frypan and let it fry for 2-3 minutes. Flip pancake and fry the other side for 2-3 minutes. 5. Repeat until you’ve used all the mixture. You should get about 8 pancakes, depending on how big you want them. 6. Serve your pancakes topped with sliced bananas, blueberries and a drizzle of maple syrup. Enjoy! Eggs and avocado are one of the most nutrient-dense duos you can find, making avocado and toast with eggs a great go-to for pregnancy and pre-pregnancy meal inspiration. Eggs are rich in protein and choline, while avocados are a great source of fiber and folate. Paired together with some whole-wheat toast, a sprinkle of sea salt and chili flakes and you have a quick and delicious meal or snack right there. Folate and choline are two essential nutrients for healthy brain development. A deficiency in folate can lead to brain and spinal cord malformations so make sure you’re eating lots of greens before and during your pregnancy – and take a good quality prenatal supplement with folate in it, just to be sure. Choline is a lesser-known nutrient that’s recently stepped into the spotlight for healthy brain development. Research has shown that choline boosts brain cell structure and improves brain function in babies and children. Egg yolks are the best-known source of choline. Protein and fiber are two of mama’s best friends before and during pregnancy. Both protein and fiber help balance blood sugar levels to prevent insulin spikes (too many insulin spikes over a long period of time contributes towards weight gain). Balanced blood sugar levels may also help prevent nausea in those first few weeks of pregnancy. 1. Fill a saucepan with 16oz of water and bring it to boil. 2. Gently place 2 eggs into the saucepan and set a timer for 7-minutes for hard-boiled eggs (unless you’re not pregnant and you can have soft-boiled). 3. While you’re waiting for the eggs, toast your bread and slice your avocado. 4. Remove the eggs from the pot when they’re ready. Run them under cool water and let them sit for a minute. 5. Smash your avocado onto your slice of toast. 6. Peel your eggs and place them on top of your toast. Sprinkle with sea salt, pepper and chili flakes. Enjoy! You can make any salad even tastier with this delicious dressing. I wish I could claim it as my own, but this is a Hemsley & Hemsley recipe that I’ve used for soooo many salads, it’s so yummy - and good for you too. The garlic and parsley in the dressing are huge immune boosters, while the tahini is a great source of protein and DHA Omega 3s, making it sooo much healthier than any of the store-bought dressings full of sugar and preservatives. I love making a batch of this dressing over the weekend and having it ready to go in the fridge during the week. I find that I'm way more excited to throw together a salad if I know I have a delicious dressing, ready to use. Plus, it’s super versatile. You can throw it over a bowl of mixed greens with avocado, beans, roast chicken, fish, quinoa or farro… anything really. Eating more leafy greens is a fantastic way to boost your folate intake. So, why not make a batch and see what salads or veggies you can eat it with? This recipe should make about 10 oz of dressing. 1. Put everything in a food processor or blender and blend together with 3 oz of water until smooth. Scrape down the sides as you go. 2. Pour over your salad or store it in a glass jar in the fridge for up to a week (if you do this, pour a layer of olive oil over it to keep it fresh). Enjoy! Each ingredient in this trail mix is a pregnancy superfood because they're packed with vitamins and minerals beneficial for both you and your baby. And you get to avoid the added sugars in the store-bought mixes with chocolate chips or yoghurt-covered raisins in them. The added sugars in the chocolate and yoghurt don't make those trail mixes a healthier option at all. If you want to make this mix sweeter, add more dried fruit. You can add bits of chopped up dates, apples, figs or mangoes (just make sure they're unsweetened). If you want to make this mix saltier, add some roasted almonds or walnuts instead. Make this mix with more of what you like and keep out the unnecessary sugars by avoiding chocolate and candy pieces. And, when you buy these ingredients in bulk off Amazon or at Whole Foods, it works out to be a lot cheaper too. Almonds are higher in fiber, calcium, vitamin E, vitamin B2 and vitamin B6, than any other nut. That's great news for pregnant mamas because fiber helps keep you regular. Hormones during pregnancy slow down your digestion so a lot of pregnant women battle with constipation. If you're one of those mamas, look for ways to up your fiber intake by eating more fruit, veggies, beans, nuts and seeds. Walnuts are a rich source of DHA Omega 3 fatty acids so they help improve your baby’s brain development and your cognitive function too. Plus, they’re rich in calcium, fiber, potassium and magnesium – the last two minerals being especially helpful during pregnancy to help reduce muscle cramps. Pumpkin seeds are a great source of zinc, a mineral needed for immune function – for both you and your baby. They’re also rich in protein, magnesium and potassium – another win for pregnant mamas battling muscle cramps in the second and third trimester. Coconut flakes are a great source of protein, fiber and iron – three things all pregnant need more of. Iron is necessary to prevent anemia during pregnancy while protein will keep you full for longer, which makes this a great addition to a snack that will tie you over to your next meal. Raisins, like other dried fruit, are a healthier, whole food alternative when you feel like something sweet. However, like most dried fruit, I wouldn’t go crazy and eat multiple servings in one sitting because of its high-sugar content. However, paired with the protein found in the nuts and seeds, they’re great for a bit of a sweet kick. 1. In a mixing bowl, add the almonds, walnuts, coconut flakes, pumpkin seeds and raisins together. 2. Mix ingredients around with your hands. 3. Put the mix in a glass jar or small zip lock bags for you to snack on during the week. Enjoy! Especially, in the first few weeks of pregnancy when you feel like carbs and comfort food, this is a healthier snack or breakfast alternative to a white-flour bagel or muffin. The protein in the nut butter will help balance blood sugar levels, to help prevent nausea. Even if you're not battling with morning sickness, the protein will also keep you full for longer. Meanwhile, the chia seeds are a great source of fiber to keep you regular 😉 and DHA Omega 3 fatty acids are a great way to boost your baby's brain development. The key step to making this a healthier choice, is to choose whole-wheat bread rather than white bread. Unlike white bread, whole-wheat bread has fiber and some nutritional value because the grain hasn’t been stripped of its outer bran layer where all the nutrients are. It's the fiber in the grain that will prevent insulin spikes. This is key to avoiding accelerated weight gain, even if you’re not pregnant. Oh, and beware of bread or bread products that have “wheat flour” instead of "whole wheat flour". Wheat flour is just another name for white flour… so sneaky! 1. Toast your bread. While you’re waiting, slice that banana. 2. Spread your nut butter of choice on your bread. 3. Arrange the banana coins on your toast, sprinkle chia seeds and enjoy!